Our Trestle Style tables are all solid wood with industrial black pipe accents. The diagonal pipes create stability and add a modern touch. - How much space do you have and how many people do you need to seat? - Will it fit into your Home/Elevator? - We can go in-between two sizes, it will be priced at the size above. Please call or email to place an order for a custom size or enter your desired size in the "Order Notes". We can go in-between two sizes, it will be priced at the size above. Please call or email to place an order for a custom size or enter your desired size in the "Order Notes". 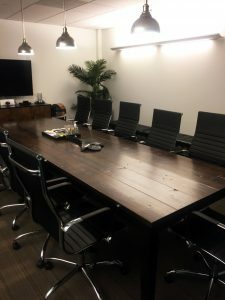 30" High - Kitchen / Dining / Conference Tables and Desks. 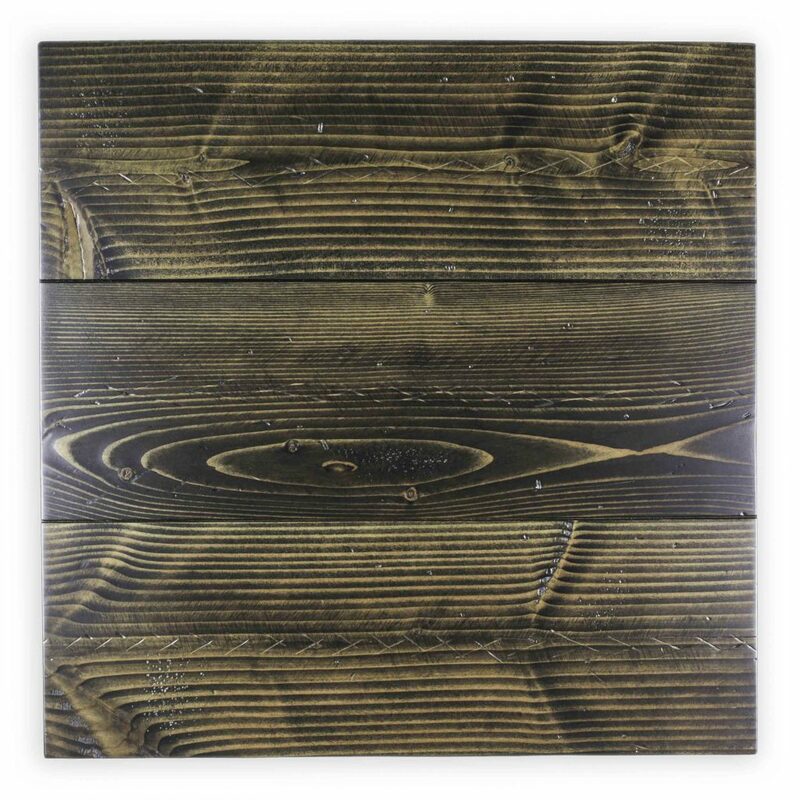 42" High - Considered "Bar Height"
Distressing is when we add some character to give the table a more ‘rustic’ look. We add some nicks, divets, sanding marks. Square Legs - This is our standard option for farmhouse legs. Table legs are square. 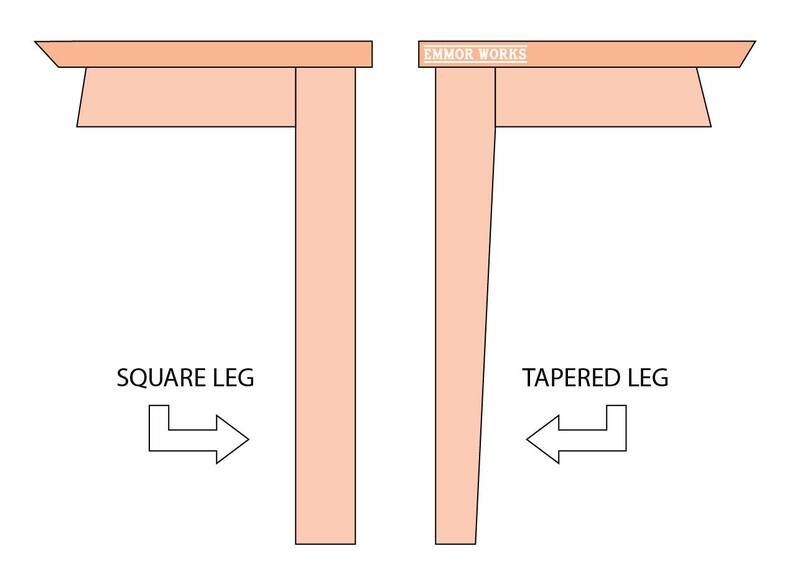 Tapered Legs - Provides the same amount of stability, but the leg becomes narrower towards the floor. Many of our customers believe it reduces some of the visual "chunk" associated with the standard square legs. 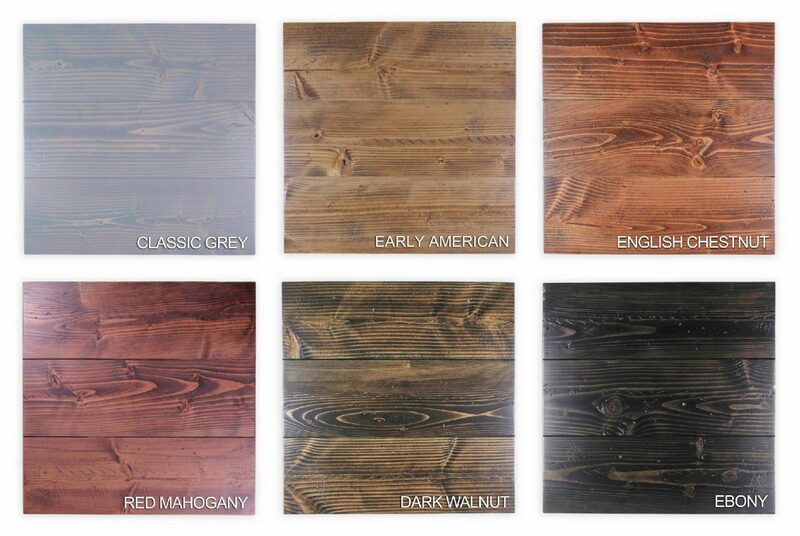 You have choice of following colors for the table base. The trestle benches are sized to the same length as the table. Benches are able to slide underneath of the table. I absolutely love my new table! It looks amazing in my kitchen and is even better in person than what I had imagined. 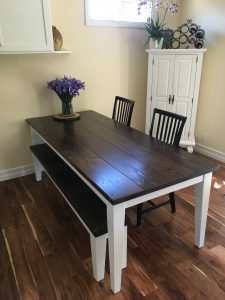 I will definitely recommend Emmor Works to anyone looking for a hand-crafted table (and I hope to someday splurge on another table for my dining room, too!) Great customer service, delivery guys were prompt and courteous. 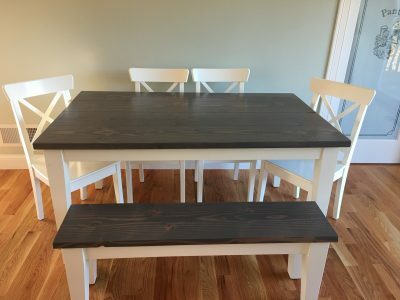 The table is solid, the ebony stain is gorgeous against the white base… I am just so happy with it! Thank you. I love my table. Great product. Great experience. Will highly recommend your company. Thank you so much !!!! I am so happy to have my new table for the holiday season !! Mike and Jeff were amazing in and out before I could even blink my eyes ! ??? 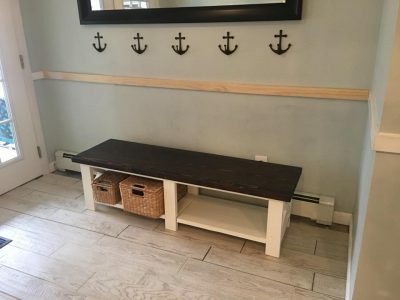 Absolutely loving the table and bench we ordered from Emmor Works for our coastal farmhouse retreat ? The quality of the table is so wonderful! Thanks so much, we have received so many compliments already! ? We absolutely LOVE the table! It looks phenomenal and it is beautifully made!! Here are some pics. We will definitely be recommending you to all of our friends and family and will always come back to you going forward. Thank you so much for excellent service! I’d be happy to like you guys on Facebook as well! 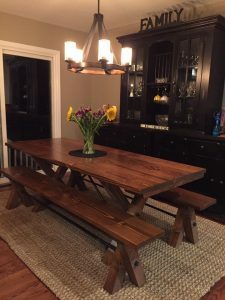 We love our Emmor farm table and custom made bench! 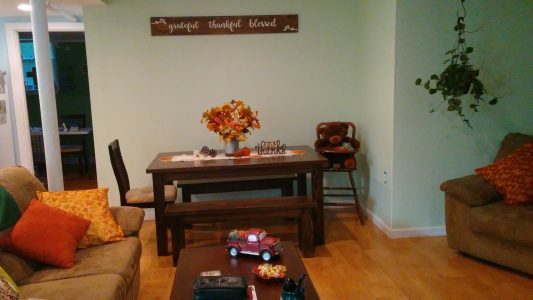 We get compliments from everyone who enters our home! Thank you! Refresh Design order 4 custom tables for one of our Interior Design Commercial projects recently! Not only did we receive beautiful tables we had the best personal customer service from the purchase to the install! Thank you Emmor Works!!! Looking forward to using you folks again soon! 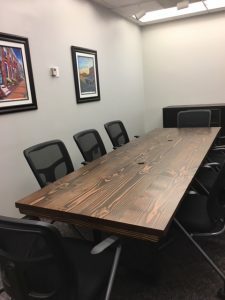 Here is a picture of our beautiful conference room table. Everyone loves it! Please thank everyone at Emmor Works for us. We love it! Pictures don’t do it justice! Thank you so much for the beautiful table, we are in love! Everyone is thrilled, thank you again for creating a wonderful table and experience for us! I had to take a second and tell you how great my whole experience was.From ordering to selecting to delivery, it was amazingly easy. And my table really makes my smallish New York city apartment 100% more functional. I’m so happy I splurged on this over spending hundreds of dollars for something else. I’m a fan. Thanks to everyone. 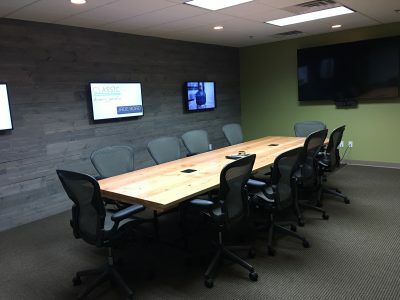 As promised, attached are some pictures of our conference room with the table. I wanted to wait until the whole remodel was done to send them to you. The pictures don’t do the table or room justice but it looks fantastic. Here’s an attached picture of the table – we’re enjoying it immensely – it’s a great piece of craftsmanship, and much admired by us and visitors. We absolutely love our new table and bench! They are so perfect – we cannot thank Emmor Works enough. The table is here! It is so beautiful and perfect! Thank you for outstanding customer service! Thought I would share a few pics of the table you guys made for us. We love it, perfect for our space! 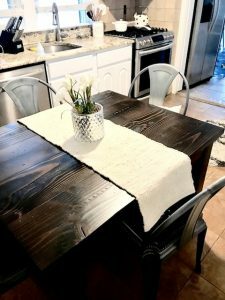 We LOVE our handmade farmhouse table! Its so stunning, and we get so many compliments on it. The color and finish on the table tie our whole room together. The quality is amazing, and Emmor works was very easy to work with. I would highly recommend them to anyone looking for a one of a kind beautiful table! We love our new table! The quality is excellent and it looks great in our kitchen. Everyone that comes over always stops to look at the table and comments how much they like it. 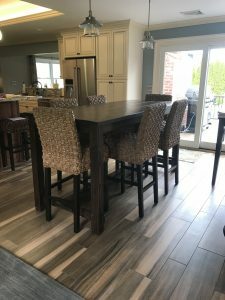 The quality and look of the table, the customer service, and the guys who delivered the table were all above expectations! I had the most amazing experience ever…. I tell everyone about you guys. 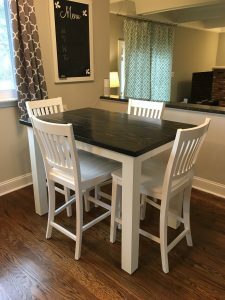 The table is beyond anything I could have imagined; It’s sturdy, well made, and has the most beautiful shine.The customer service was outstanding. I can’t wait to order our next piece !!! I just wanted to let you all know how much we LOVED working with Emmor Works for our new dining room table. From beginning to end, the process was smooth and painless and the final product was EXACTLY what we wanted. The desk is fantastic. I am very pleased with the quality and finish. I also would like to mention that the delivery crew was great – professional and really great guys. I am moving to a larger house and will definitely be ordering from Emmor again. Great company! Thanks!! We love our new tables! They are so beautiful. You guys do wonderful work! The delivery went very well. The guys were very courteous and helpful. We will treasure our tables for years to come! Hi! Thank you, we love the table! I will send a pic once I find chairs. We will definitely refer you guys to friends, the quality is outstanding. And the delivery guys were super professional and cared very much for the safety of the table as they helped to load on our truck. 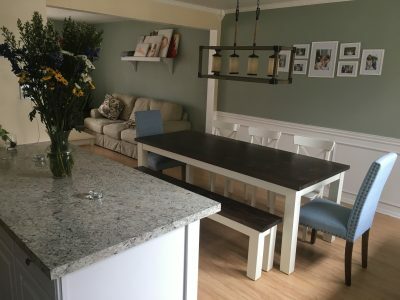 Picked up our 6 ft table back in March, still putting some finishing touches on our kitchen but table is beautiful, well crafted, and quite the conversation piece. Just wanted to say thanks! The table is awesome and everything we hoped for! Thanks so much. I wasn’t there at the time of delivery but my wife sung your delivery guy’s praises! Thanks again and we look forward to possibly purchasing some future pieces down the line. We received the table yesterday. It arrived in excellent condition and we’ve already built it. Thank you so much for working with me, we are very happy with the end result. To say it’s awesome would be an understatement– we love it! Thank you so much. We love our tables and bench. They are absolutely beautiful. The quality and craftsmanship are top notch. It has been a pleasure working with you. I wish more people did business like this. Definitely will recommend you guys to others. Thanks for writing. You delivery guys were great, everything went well, and we love the island, it is really great. Just ordered some industrial style stools for it. We are very happy with your product and your company, and hope we will be able to buy again from you in the future. From start to finish we could not be happier. Everything exceeded our expectations. Thank you for everything. We love our table!!! Theresa is meaning to write you herself – she had a wonderful and pleasant experience with your installer. We’re actually planning a farm table-themed menu for Father’s Day. Can’t thank you enough for your patience and being communicative throughout the process. We’ll definitely recommend you. I LOVE LOVE LOVE my table and bench. I’ve had 2 friends over since it was delivered and they were both blown away. It is truly beyond my expectations. It is one of a kind and so special in my home. 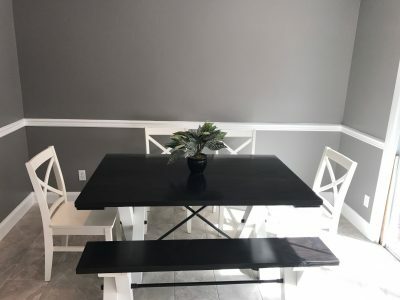 I can’t wait to find chairs and actually use it to dine at! Lol. Right now my daughter and just sit on the bench together and eat! Please send me a link to write a review or tell me how I do that because I will give Emmor Works – and the staff – all very high praise. The tables are beautiful, thanks. They look great. And the guys delivering/installing them were great. We’re in a small office building on a block that’s impossible to park and they were very nice and real pros. 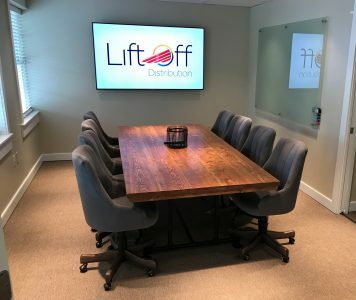 I may be in touch in the future to purchase a wider version of the conference table. I meant to email you to say thanks. The table looks great. Lots of character. I’ll be giving your info to friends of mine who might be in the market for some of the items you make. We absolutely love the tables!! Wow you guys do a phenomenal job – we couldn’t be happier! Thank you so much!! I LOVE the table and am telling everyone I know about you guys! Thank you so much, I will be enjoying this table for many many years. We want to tell you how beautiful our table is, and we cannot thank you enough. Our house finally started to look like a home as soon as we put the table in the dining room. It is absolutely gorgeous! 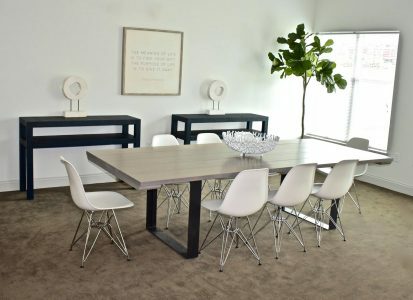 We will undoubtedly tell friends and family about your business when they ask where we got our dining room table. We wish you so much success, and should we need any more furniture for the house, you will hear from us! Thanks Melinda! From start to finish, you guys have been fantastic, I have been recommending you to our friends, and will continue to do so! LOVE IT! It looks amazing. We will send over some pics shortly…. The crew was great, nice guys, all was seamless, looking forward to having you do some more work and recommending you as well, thank you again! 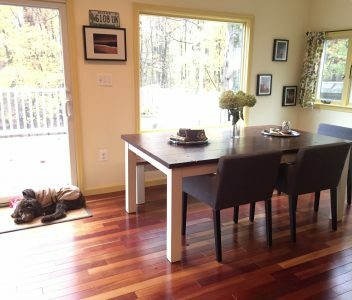 I just wanted to say a big thank you for our beautiful, beautiful table and bench that we received this weekend. We absolutely love it! Once we saw it in place, we knew we made the right decision in changing the base color, so thank you for that last-minute accommodation. The whole experience – from our initial conversation to the delivery with Mike and his colleague – has been absolutely wonderful. 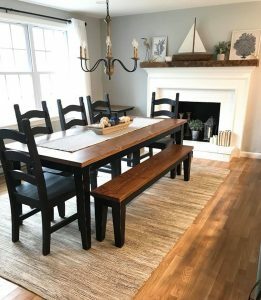 Having a nice dining table for our growing family and new home was very important to us, and the experience with Emmor Works has been perfect from beginning to end. We’ve already started spreading the word with our friends! Just wanted to show you our new furniture in its new home. 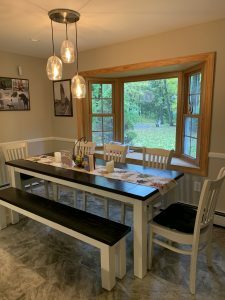 We absolutely love the table and shelves … the new desk with the matching bench is also wonderful… the kids love it!! Everyone that comes over loves it as well. I am referring alot of people to you as they are impressed with your work. Thank you again for making this such a pleasurable experience. I just wanted to again say thank you so much to you and the team at Emmor Works. Our table came this morning and it is absolutely beautiful! We are so happy with the outcome and really can’t thank you enough. We will certainly be sharing our experience with friends and family! We absolutely love the table & bench! Thank you so much! The delivery guys were great too! Here’s a quick picture but will send another or post on your Facebook when I get some chairs! Thanks again!! I just wanted to say THANK YOU! 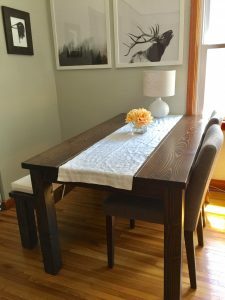 The table you built us is beautiful, I am blown away! We move to a new house next week and I can’t wait to set it up…So glad we found your company! The delivery crew was awesome too! Emmor Works is located in South Jersey and we deliver up and down the East Coast, primarily to New York City, Baltimore, Washington, D.C., Boston, Philadelphia, and Local Areas in South Jersey and PA. Send us your zip code to learn more about deliveries in your area. Due to size and weight, items will be delivered to curb side, driveway, or entryway. Items will be wrapped minimally. Customer must be present at time of drop-off. A delivery window of 1-2 hours (plus or minus 20 minutes), depending on your location, will be provided prior to delivery. Tables are delivered with the legs/base detached. With a standard home tool set, it is an easy process to assemble. Deliveries typically take place Monday through Friday, 9AM to 4PM, but may go into the evening. Group Deliveries typically take place on Friday-Sunday (see below for cities and dates scheduled). If you have further questions, please contact us. By the Wednesday prior to the scheduled Group Delivery Date, we will provide you with a specific day/time slot. Your delivery date and time are based on your location relative to our delivery route. In order to reduce the cost of deliveries for all customers, deliveries are scheduled in advance and cannot be modified. To save on the delivery cost, you are always welcome to pick up your order from the shop (for free!). Please remember to bring something along with you to keep the table comfortable on the ride home (e.g. blankets, cardboard, straps, etc.). Table is not boxed or wrapped. Pickups take place during regular business hours, Monday to Friday, 9AM to 4PM. Contact us if you are interested in alternative delivery options. Tables will only be brought to an upper level if the table fits safely in an elevator. Please double-check your dimensions before placing an order. Don't see your city listed? We can look into Freight Shipping options for you. Send us your zip code and the size table you're looking for.